It is true that there are days when you feel totally motivated and you are driven to take on the world. And there are also days when you feel like a slump, you don't have the motivation at all, and you just want to do nothing except lying on the couch and watch TV. No matter who you are, whether you are a highly successful individual like Steve Jobs or you are just a normal person, I believe that every one of us faces days when we don't have the energy and motivation to do things. However, that does not mean that you have the right to be lazy and put things off, and you should allow your emotions to control you. Yes, motivation is a feeling, and feeling is an emotion. First, if you want to get motivated in life even when you don’t feel like it, you must focus on only doing one thing at a time. Too often, people procrastinate because they lack clarity. They have no idea what they need to do, and hence, they fall into the reactive mode and become responsive to whatever things that come to them. When you are in the office and you have no idea what to do, you will do things that seem like work, after all, you don’t want to look bad in front of your colleagues for being lazy, right? When you are at home and you have nothing to do, what do you do? You choose to waste your precious time by watching TV, playing games, or sleep. Can you see the pattern? When you lack clarity and you have no clear goal, you will become no motivation. This is why you need to focus on doing just one thing at a time. So, find out what you need to accomplish today and set it on a schedule and complete it. When you commit to something, you will automatically come up with the motivation to do it. Even when you don’t feel like doing it, you will still choose to do it because your reputation is at stakes. Thus, try to share or announce your goals and plans with people who care and will support you. When you tell others about what you are going to do, you are putting yourself on the line. Yes, you may feel stress, but it is a good stress where scientists call it eustress. And it is the eustress that motivates you into taking action. Besides making a public commitment, another effective method to ensure you get motivated to do the work is to get an accountability partner. It works just like a coach or a mentor. In the sports industry, you will see that all the professional athletes have at least a coach to guide them and remind them of their goals. A coach can be considered an accountability partner where he or she will ensure you do what is necessary. And when you are down, your coach can encourage you to move on. Regardless of whether it is in your personal or professional life, you can get yourself an accountability partner to keep an eye on your progress. For instance, if you want to hit the gym twice a week, the best way to make sure that you go to the gym and workout is to get a partner to join you. When you are doing something together with someone else, you are less likely to procrastinate. 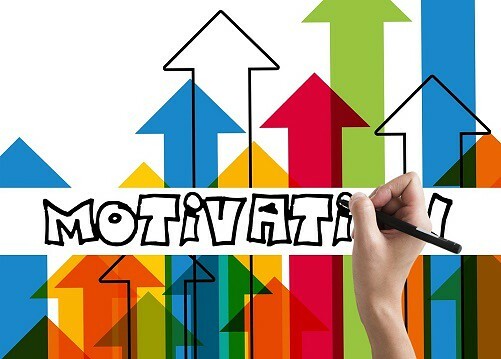 Furthermore, studies have also revealed that working as a team increases the likelihood of success and also able to boost each individual’s level of motivation. Most people are extremely motivated in the beginning when they first started out to achieve their goals. However, as time goes by, they slowly lose their motivation and their passion started to fade. The reason is that they don’t celebrate their wins and their progress anymore. When you start a blog and receive your first comment from a reader, you feel the thrill. After that, it becomes a norm and you don’t feel as excited as before anymore. And this is when people start to lose their interest and motivation. Never let this happen to you. You must celebrate your wins no matter how small they are. If you set out to write a 10,000 words PDF guidebook in a week and you fail, do not worry, choose to celebrate because you make progress and successfully written 7,239 words. You then need to press on and continue to hustle to reach the goal. As long as you have put in the effort and make some progress, you should be proud of yourself and give yourself a pat on the back. The more you celebrate, the more you will have for celebration. Do you know that talking to other successful people can make you motivated? Imagine when you talk to people who are absolutely positive and have achieved a certain level of success in their career. The way they talk and think is totally different from the ordinary people. They talk about their goals, they talk about their dreams, and they discuss the rewards they get from their hard work. How will that make you feel? On the other hand, when you talk to people who are negative and unsuccessful, they will talk about other people most of the time. They blame everything and tell you how silly their companies or bosses are, and they make all sorts of excuses for why achieving greatness are impossible. How do you think this will make you feel now? Thus, make more time to network and talk to other successful people. Sometimes it is difficult to have the motivation to work on your goals, and one of the solutions to this is to start small. If your goal is to write a 1,000 words article, try to start by just writing the first paragraph. And if your goal is to do 50 pushups, just start with doing only 5 pushups. The key to starting small is so that you can lower the resistance to doing the work. Think about it, writing a 1,000 words article is more difficult than writing a 100 words paragraph. And doing 50 pushups sound so difficult that you will want to turn off the idea of doing it. Thus, this is why you want to break down your tasks into small and manageable steps. Therefore, try to start as small as possible. You want to build up the momentum by putting yourself into action. When the momentum is there, you will continue to work on the task until you complete it. Another good strategy to stay motivated for the long-term is to read every day. This is especially true when it comes to reading success stories and personal development books. We all know that reading personal development books can inspire us to achieve more, but most of us are not doing so. You can start off by reading a book or two in a month. Plus, you can also read articles and watch inspirational video clips to keep yourself motivated. Visualization is a powerful tool that almost every successful individual uses in their journey to success. You must see, imagine, and visualize the goals you want in your mind before you are able to materialize it in your life. Scientists have discovered that visualization works. There was a study conducted on a group of basketball players. The players were divided into three groups, a control group who did not practice shooting, a group who used visualization to practice their shooting, and another group who went through regular real shooting practice. The study discovered that the group who visualized their practice improved their shooting skills almost equal to the group who practiced real shooting. Hence, practice visualization. See yourself achieving the goals that you desire and imagine yourself already living the successful life you want. This may be a common technique to motivate yourself, but never underestimate its effectiveness. Affirmations work just like a pep-talk or a war-cry. It can boost your mood almost instantly. However, you must make sure you do it as seriously as possible. And of course, you must repeat your affirmation as many times as possible until it sinks into your subconscious mind and makes you feel motivated. It is a great way to start your day with affirmations. Telling yourself great and amazing words each morning can make you feel positive and motivated. Finally, have something exciting to look forward to. If you want to have the motivation to go through each day, you must have something to look forward to. You must have something that you are excited to enjoy. For example, a great and healthy breakfast in your favorite café can motivate you to wake up early. And a golf game in the weekend can motivate you throughout your weekday to finish your work so that you can enjoy golf without stress. Therefore, create something exciting that you are looking forward to. When there is something exciting you truly enjoy waiting for you, you will have better motivation to hustle through the now and move forward.